The subject of 'influence', and in particular, 'online influence', has undergone quite a bit of debate in recent years. It's fair to say that there haven't been any standards for influence that have swept companies or institutions off their feet. Tech platforms like Klout, Kred and PeerIndex have respectably undertaken new approaches for measuring online influence, while a host of universities and independent entities have been doing research around the composition of offline influence. Personally, I've always looked at the two as interlinked. The study of neural networks brings to light a new set of possibilities concerning the attributes of offline and online behavior. I've radically oversimplified what this could mean here, but suffice to say I think the general premise should be that influence is the measurement of resonance and impact between ideas, to which people ('influencers') serve as catalysts for co-creation or reinvention, rather than mere 'experts to follow'. People, in essence, become cognitive authorities, and take on adaptive roles. These dynamics reflect an acute mix of biochemistry, neuroscience and social epistemology. Patrick Wilson's epistemological approach can be explored further in a number of intriguing white papers, which of course predate the social web. This book of his, in my opinion, encapsulates the power of cognitive authority; it examines the many ways we seem to be overlooking the value of networked information streams in our current technological, data and media practices, and how we tend to base influence on more superficial variables such as wealth, social status, professional status and marketing reach. What we are challenged with at present does not do away with the notion that you can follow influential people and ideas, but rather that influence would become a contextual basis through which information flows. This is becoming more and more apparent in my own work, especially as technologies have become more 'personalized', information has become more automated, and operating context, overall, is more elusive than ever. Identities are easily constructed and manipulated per superficial attributes (career, title, early adoption, etc.) when in actuality they should be more about what one does with or within a domain, across domains and the kinds of experimental learning someone is capable of. Opinions are abundant, as we know. How opinions relate to experience and ongoing conversations, as well as a 'factual' basis for understanding information is a whole other matter. We have a lot of work to do in this regard. Much of it has to do with ingrained behaviors with respect to media consumption and what we can do to 'unlearn' them. 'Facts', historical accounts and empirical evidence (scientific or 'other') are also under constant revision, to which contextual foundation and consensus are consistently challenged. If knowledge can be networked, then we have a responsibility to (re)distribute or federate that knowledge as openly as we can, such that we can question more and discover more of the 'unknown unknowns'. Our intentions -- what amount to a defined sense of social responsibility -- are another major factor in all of this; our contributions to society and the (co)creation of value and value alignment are critical in determining the kind of influences and impacts we want to have in world that often times feels completely amoral, unethical and operationally rudderless. If the central challenge is to make information 'easier and more digestible' then we must consider the costs in making/taking shortcuts. We cannot sacrifice critical thought for brevity. We cannot supersede personal and collective growth for the pursuit of transaction. We cannot assume that information -- like human and natural resources -- is in endless supply, when economic scarcity regulates these same systems. Hopefully that will change soon. In the meantime, we need to be equally smart about who we are and what we want, and act accordingly. Dear Marissa: Want Yahoo! to succeed in the TV biz? Reinvent how it's measured. Hello, Marissa. I'd like to preface everything I'm about to say with the acknowledgment that you're a great executive. You're a consummate professional, a strong leader and you've taken on one of the most challenging jobs on the planet. That was a doozy of an article, that New York Times piece stating Yahoo! is getting into the TV biz (again). All of it seemed to be encapsulated in the request for "series that are ready to launch and don't require a lot of development." I think two guys, recruited into Yahoo!, said a similar thing a decade ago. I remember the day clearly. I was 31, and had started my own branded entertainment boutique. Over at Yahoo! (not too far from my offices at that time), Terry Semel and Lloyd Braun were officially building a slate of content described as "immersive original programming". I thought to myself: "Finally, the world is going to change! This Internet thing is going to liberate content creators and create a whole new marketplace!" There are lots of reasons why that didn't happen. Chief among them has been the long-standing idea -- an operating ethos, if you will -- that technology companies know media, and media companies know technology. Well, they do. Sort of. They just don't know how to innovate and how to monetize at the same time. The AOL-Time Warner merger was a great example of this pervasive reality. Of course, plenty of other attempts have been made ever since. Remember Julie Roehm of Wal-Mart infamy? She and a motley crew of folks tried to reinvent the upfronts. Then several other attempts were made to reinvent the set-top box (remember Slingbox?). Then panel research. Then surveys. Then brands slowly evolved this idea of entertainment. And so on. What do we have today? We have video upfronts and digital content 'newfronts' (yes, a marked improvement), but more or less fancier, shinier boxes (read: prettier set-tops and ad units), and more or less the same system of measurement, and more or less the same territorial squabbles for rights and distribution amongst cable nets and 3rd party providers. All of which, suffice to say, hasn't stopped storytellers from making some amazing stuff. And that's just it: this is the golden age of storytelling. Not advertising. Not content marketing. Not alternative programming. Not social TV. Not online video. I've been experimenting in media and entertainment for a long time, and as much as I love technology and hate the status quo, last time I checked, Hollywood and a significant long-tail of independent content creators had the storytelling gene, not Silicon Valley. Yet, there remains a silver lining. What's novel about shows like House of Lies and House of Cards and True Detective and Game of Thrones isn't just the fact that they are great shows with great writers and great casts -- it's the fact that TV has become serialized in a really special kind of way. Netflix, of course, has completely changed the game by producing great material and serializing it for those wonderful, binge "TV anywhere" experiences. Serialization means that creators can develop shows with more imagination and depth, and audiences can be more preferential in their tastes than ever before. This also means that data are really important in understanding these respective behaviors. The online makers movement has changed the game a little, but I don't think it's much of a stretch to argue that the bar on quality and scale hasn't been raised much. Part of this has to do with the fact that these content channels aren't really looking at how to sustain audiences for the longer haul, and how to shepherd them into different areas of media and social environments. Not yet, at least. Then again, we're talking about different markets with derivative business models. Disney just spent $500+mm on a service platform (Makers Studios) in the hope that something will change. Or not. But where the rubber meets the road for large Internet companies still remains to be seen. In Yahoo's case, I don't think it's some half-baked decision to develop a programming slate. Excuse me, a pre-developed programming slate. If history has any bearing on the learning process (which most times it doesn't), then the "been there, done that" credo might need a little more greasing of the gears. Terry and Lloyd knew how to attract talent, but didn't understand the Internet. The grand irony in all of this, of course, is that good storytelling and audience retention are inexorably linked, and the Internet could be the great wide open for 'new' forms of storytelling. Those of us in various storytelling communities have been pushing the boundaries in our own ways for the last 18+ years, waiting for the big guys to catch up. Problem is, no amount of money or acquisition power can buy you that kind of talent and those kinds of skills. If they did, Hollywood would be a very different business today, and companies like Google would have a far more diverse core search and advertising business. But they're not and they don't. So companies like Yahoo! need to get real about what the opportunities are and how they can be cultivated. You've already played a tremendous hand in developing and enhancing Yahoo's impressive slate of utilities (apps, news, content, etc.) and a publisher network with a diverse array of content creators, news makers and media buyers. Let's not forget its impressive video capabilities, which hasn't quite suffered the fate of MySpace. And your support of Yahoo! Studios has been a smart play not only in terms of its successes, but in having a front-row seat witnessing the shifts in online content. However, what that shift translates into is intelligence. I like to call it 'audience intelligence'. As you may have already discovered, there are caveats to what data can do in the form of intelligence. TV audiences don't behave the same way that Internet audiences do, even though there are quite a lot of overlaps. The TV experience itself isn't typically "lean in" or "lean forward". And yes, people have device preferences, but they also have genre preferences and are willing to participate in the creation of show content. This, in my opinion, is the true value of social networks. They are participatory, not just vessels for ads and content. Your competitor cohorts don't seem to get this, or maybe they don't want to. See where this is leading? To be perfectly clear: just because we can measure everything, doesn't mean we can create anything we want. I saw this paradox play out in spades when we were building enhancements to the Coincident TV platform. We were using video and digital content ('social media') to provide show runners with data and insight they couldn't get anywhere else. We also had a markup language that allowed them not only to have a second screen (or multiple screens), but a means to distribute content attuned to the sharing behaviors of their audience segments. The net-net of that experience was two-fold; first, what we measure, how we measure and who we target are contingent upon the ways in which a network behaves. I'm talking about channel to channel, peer to peer, online and offline, and most importantly, how people tell stories and share stories in different media environments. The whole enchilada. On the flip side, we can't keep looking at reach and frequency as the only core metrics that matter... Because if the social web has taught us anything, networks spread information through common interests, intentions and relevance to ideas (or in the case of programming, themes). Google recently announced that it has a new system to measure across channels. Problem there is, it still wants to funnel people into its own pages and channels so it can sell ads against the impressions. Old model. Bing has an entity search system that can run high-end video content with geolocal data. Cool stuff, but the audiences aren't very captive, nor do conversions lead to much in terms of repeat views, or in some cases, repeat purchases. AOL has been silently stepping up its content capabilities, but relatively speaking, doesn't have much traffic or effective reach across channels, despite some very smart partnerships. Facebook, despite its recent advances in mobile, is still shoehorning ads into people's feeds. And Twitter, despite entering the original programming space through various deals, is still struggling to understand how to monetize content with and without ads. The Nielsen-Twitter deal? I won't go into specifics here, but let's just say that the social TV revolution hasn't quite arrived. Not yet, at least. See, none of these companies are measuring and levering networks of people. You know, audiences. They're acting like old media companies. Truth is, audiences don't prefer channels or platforms in the same way 'users' do. And users don't like to discover that their identities, their data, and more importantly their ideas, can be gamed and used against them, no matter how cool the content thrown at them can really be. Meanwhile, all the usual suspects -- cable nets and primetime networks -- are continuing to do their thing by making programs that people actually like to watch, and show content they talk about. Just two weeks ago, I watched a panel of five top cable network execs wax on about how the broadcast model "isn't going to change for another 10 years." If I were in their shoes, I'd probably think the same way. Heck, I applaud their tenacity. That said, there is one big Internet company that does 'get it', and that's Amazon. Amazon has all the creative, production, distribution and processing power, and soon it's search and discovery capabilities will catch up with its investments in a real, sustainable information ecosystem. In plainer terms, Amazon is investing in media by learning how information systems actually operate in the 21st century -- this is why it bought newspapers and is building software tools for storytellers, among other breakthrough efforts. If you look closely, Amazon is investing, literally, in networks of people. Amazon doesn't need ads or impressions to rule the roost because information systems aren't really about ads and impressions anymore. They're about distributive purchasing power. I'll repeat that last phrase: distributive purchasing power. So what's the game-plan actually gonna be for Yahoo? If I were a betting man, I'd say it has one, huge glorious chance to help networks of all kinds reach and captivate new audiences, and connect to 'brands' in a totally different way. But in order to do so, it's going to have to get deeper into the information business, not media or entertainment, or God forbid, advertising. Please, Marissa, do us all a favor, don't make the same mistakes Terry and Lloyd did. Let's not wait another 10 years to 'figure it out'. You're too smart for that, and besides, it's time for someone to leave behind a different kind of legacy -- a sustainable legacy made for a brand that's been lost in the woods since Lloyd and Terry came riding into town (not Tinsletown, the Valley). It starts with data, and it builds momentum with content that audiences actually want. You're kind of doing that already with your news digest. Now think about the implications when themes are pulled from those respective data sets to understand what types of show content can be created. You might even be able to create whole new subsets of show content. 5. Lots of courage in the face of media conglomerates and analytics companies that are wildly averse to change, but many that would be willing to accept a new approach if they could actually 'see' what it looks like. Good luck, Marissa. There are more than a few of us rooting for you. Personally, I would love to see you win this game. It's been really fun to think more earnestly about human-centered design and ways to apply its respective processes in building new companies. Even more interesting is how these processes reveal emerging archetypes that reflect a holism in what we see as desired outcomes. The basic premise behind the construct is this: a CEO is the centrally designated "dreamweaver", while other team members act as cohorts and lead in their own ways, with roles that are called upon at certain times and certain circumstances which amplify their strengths. The dreamweaver (or some other chief executive) coordinates these actions whereby everyone learns and further adapts. In truth, everyone is a dreamweaver in their own ways, yet our current pyramidal systems don't usually allow that meta-archetype to manifest itself in the functional roles of the "manager", "director" or "executive". More important is the idea that modular functions within either hemisphere of the brain (or the "mind-heart") can actually build atrophied muscles and dormant skill-sets through the power of experimentation and collaboration. This flies in the face of dualistic or strictly "left brain" or "right brain" thinking. In my opinion, this will define the winning cultures of the future, because it will empower individuals and groups to live out their dreams and carve out a higher purpose as contributors to society at large. * Facilitators tend to apply these same functions into grand visions for business and product applications. This is more extrinsic (outward facing) and takes the internal DNA of the company, its values and its functions and applies them to business partnerships and society at large. Operating from "the center", the Dreamweaver finds himself or herself constantly managing tensions reflected in pedanticism, empathy, collectivism and language. These are very human dynamics not "owned" by a particular individual or group, but perhaps catalyzed by them. It is very important to note (or better yet, to observe) that as "meta values", they are also not "good" or "bad" but in need of constant attention and care. All members of an organization exhibit these values; the challenge is to understand what they are, when they are happening, and to do something about it. Adaptive systems, in general, are designed to bring out the very best faculties in individuals and groups. They also bridge the gaps between business and society. This is really, really important, especially for startups. Storytelling and archetype are of course nothing new as elements in business, communications and product development. What's changed significantly is their modularity and transferable value. Louis Cheskin talked a lot about this as a marketer and communications innovator (sensation transference), and Adler took Jungian and Freudian archetypes to a whole other level by recognizing that they were representations of holonic behaviors (in fact, this is precisely where Adler departed from Freud's more reductionist thinking). I'll have more on this subject coming soon, and will discuss the applied uses of this approach through the lens of a couple of new ventures I'm helping to build. In the meantime, tap into your archetypal roles and keep experimenting. Business environments are fertile ground for testing and cultivating the human condition in positive ways! The Key to Cultural Innovation? Self-Love. A few years ago, I discovered a conversational framework in pre-marital counseling that opened my eyes to how trust might actually operate in relationships (you can already guess what happened to my marriage... ;). One of the revelations I had was that you don't just build trust in relationships, you go into relationships having trust in yourself. I sometimes cringe when people talk about trust as though it is a given, as they tend to gloss over the realities of physical and mental interaction. This is especially the case when people wax on about social business or social technology innovations. But that is all well and good, because it is all part of the process of awareness, and I think the concepts tied to trust are important for people to build upon in their own ways and at their own paces. We all know that relationship dynamics can be very complex, but I do believe that trust itself is quite simple in its faculty. I've also witnessed some very interesting transformations, both in the startup work I've been doing, as well as in some of the innovation work I've been privileged to be a part of. This is one of several scientific studies I've researched that seem to corroborate what I've experienced in different entrepreneurial and corporate settings. And there is always the inimitable Csikszentmihalyi (tongue-twister!) from which to draw inspiration. - How do I feel about myself when I enter group environments? - How do I choose to communicate those feelings? - How do I express my values in such a way that they can be understood? - What are my true intentions? - What are my perceptions of self as I interact with others? - What am I willing to do or contribute to change those perceptions? - Can I empathize with others and align my values to theirs? Self-love, of course, doesn't refer to a reliance on Ego (the self-consumed part of it), but rather a completeness or a mindfulness that one can share love and be loved. Confidence, therefore, can manifest as an organic expression of that self-love, and can literally permeate a room or physical space with an incredible aura. In online spaces, it can certainly catalyze the visions or perceptions of what a relationship might become. Lest we forget that we can design platforms, experiences and/or ideas for trust-building, and we can engage in trust-building exercises, but there is a significant awareness factor that cannot be ignored. Admittedly, I've made a lot of mistakes in this respect; it's one thing to want to trust someone, but it's another thing to hold trust, earn trust and share trust with other people. I've had a few situations over the last several months in which trust was broken, in part because I failed to see what the the potential for trust could even be. That is something I've had to own as a part of my self-responsibility, my own learning experience. I also have to reconcile with the possibility that perhaps, to those people, I just wasn't trustworthy, for whatever reasons there may be (some of those reasons I'm still trying to figure out and incorporate into my own realm of understanding). On a more positive note, I've also repaired a couple of broken relationships because I was able to communicate my ownership of the issues, and was able to align a set of values with those people. So, it seems we can design for trust, but we don't actually design trust itself, nor do we really engineer its mechanisms. Then again, who knows what today will reveal. In the meantime, perhaps the graphic at top will help you in your own design work. Next month, I'll be delivering a keynote at TruEffect's Brand Partner Summit in Boulder, Colorado, on the topic of storytelling and advertising. I've talked a bit about the future of ads in general, in particular as a service industry. The real context I'd like to address right here -- and what will serve as the backdrop for my talk in Boulder -- is what is actually driving the media ecosystem and respective information systems as a whole. Right now, Google seems to have the upper hand. But this won't be the case for much longer. "In truth, the 10 ‘facts’ I’ve outlined above are not mine; these are the opinions I’ve collected over the past year asking intelligent folks, ‘So what do you think about Google?’ These are the 'facts' as the people see them. Although, I haven’t found anyone who disagrees with these 10 facts – do you?" Well, I'm not going to disagree with Calacanis per se (he has access to a lot more inside info than I do and I have lots of respect for him as an entrepreneur and investor), but I am going to challenge the list of assertions he provides within context. Here they are, point and counterpoint. 1. No company has as many smart people as Google. -> Define 'smart'. In a 'wicked' complex world, creative intelligence (or 'EQ', emotional quotient) is just as important as quantitative or purely scientific chops. 2. No company is as ambitious as Google. -> Define 'ambitious'. Do you mean to say that a host of companies without Google's market cap or footprint aren't taking on significant cultural mores, or attempting to create massive social change (for the better) -- like Amazon? 3. No company is working on as many hard problems as Google. -> Define 'hard problems'. Defer to counterpoint #2. 4. No company makes as many big bets as Google. -> What kind of bets? With what intentions? Defer to counterpoint #2. 5. No company is willing to make as many crazy acquisitions as Google. -> Maybe so. But there are lots of companies that don't have to acquire as much in order to 'push the envelope' as it were (i.e. market ownership is not the same as market creation...). Defer to counterpoint #2, with the caveat that Amazon is buying a lot in order to strengthen its infrastructure and market positioning. 6. No company has more data than Google. -> Perhaps. But is it all the right/best kind of data? (i.e. Is it clean? Can it be parallel processed? Is it behavioral? Does it seamlessly connect to the knowledge/social graphs? Is it scalable through reference/inferential databases? etc.). Defer to counterpoint #2. 7. Few companies understand how to play the government better than Google. -> Probably the case. But in Google's position, and given backdoor surveillance (as just one example), is that a good thing? More importantly, is Google really influencing policy in the best interests of us (its users)? 8. No company has more global influence than Google. -> Right now, probably true. But that won't remain to be the case. Defer to counterpoint #2. 9. No company is as ruthlessly efficient as Google. -> From my own experience working with Google (Google 'proper' and YouTube), that's simply not true. Great company and great people, yes, but 'ruthlessly efficient', no. 10. Only one CEO is more ambitious than Google’s Larry Page. * -> Jeff Bezos? As you might've gathered, I have a thing for Amazon. Don't get me wrong, I think the world of Google, but Amazon is a special kind of dark horse (if you can even call a company that big a 'dark horse'). This Atlantic piece, which came out right around the time Calacanis wrote his post, was a really good, balanced take on how Amazon is making seismic moves. The basic premise -- and my firm belief -- is that any company which thinks the way Amazon does long-term, to include massive financial risks, will 'win' long-term. Now of course, pundits will say that Google has always thought long-term. That's debatable. Per the (counter)points above, Google has thought long-term about experimental domains like artificial intelligence, quantum computing, sustainable cities and transit, but I would assert that it actually hasn't thought that way about its own $28bb+ core search/ad business. Amazon has just about every asset in the new commerce toolkit, and it's only a matter of time before its search product catches up with its capabilities in content, storytelling (journalism especially), publishing, purchasing, production, cloud/quantum computing and network distribution (private, social and virtual). Bottom line: with its advanced ecosystem, Amazon doesn't need ads or impressions to rule the web like Google does currently. If you'd like more validation on this position, check out a wonderfully curated thread my friend Alex Schleber put together in early February -- he poses a great list of questions (probably better than those I did here), and there's lots of contextual grist to explore, replete with great data-points. The 'battle' between Google and Amazon, as it were, will likely produce cultural tensions that will push all of us to think differently, consume differently, produce more thoughtfully and tell stories with more of a bent towards real social utility. As a result, I think we will see the emergence of a truly co-opetitive economic landscape, in which ecosystems amplify these tensions and create amazing new ways to improve our world. It will be exciting to watch and participate. Happy New Year! 2014 has already proven to be quite fruitful and full of new roads for discovery. As a follow-up piece to previous posts on conscious capital, co-op investments and discovering value in the age of bitcoin, I thought I would share a video of my talk in Grasse from October. Some of the corporate examples of sustainable innovation you're probably familiar with, but it goes a bit more into how these kinds of efforts can scale in a global marketplace. Many companies are still hesitant to invest in sustainability efforts, and I believe that's because disciplines like CSR are more about good branding than good business models. But that's all changing. The real emphasis is on how people can transcend their roles and responsibilities at work and in everyday life to become progenitors of change. This has been the core philosophy behind the innovation experiments we've been running around the globe, and it involves much more than good technology and fancy methodologies (although those elements are, of course, important). In this case -- enabling executive stakeholders in the cosmetics industry to imagine a different world through their products -- we were able to spend four days developing creative muscles, nurturing personal and group awareness, as well as running through role-playing scenarios. The participants literally built worlds or ecosystems that reflected ecological and emotional connections to their companies, and the economy itself. One CEO even remarked that in doing so, she envisioned a new world without economic bubbles. Related to 'anti-bubble' economics and scale, Marc Andreessen was featured in an insightful piece in the Wall Street Journal a few days ago. That said, I thought the interview with him below is a terrific view into the immediate future (what I call the 'Future Now'). In particular, it's interesting to hear his thoughts on globalization and how value is created in competitive markets through an entrepreneurial mindset. I wish that he and other innovative investors would address more of the 'human problems' we face (Mr. Andreessen does touch upon on it in spots), but their intentions seem to be headed towards more of a socially conscious approach to investing, alongside of building sustainable companies and economies. As I've mentioned in other posts, the concept of work is completely transforming, and not just as a by-product of repatriation, disintermediation and other production or transactional efficiencies (which are becoming more and more obvious). Passion and empathy are co-opting 'work' as a cultural edict and a form of social responsibility that embrace the complexities of human discourse. People want to change the world -- they need to, and they're figuring out how to make it happen for themselves and their communities. And what a wonderful thing that is to see. I've been thinking a lot lately about how positive thinking induces more productive, creative and happier futures. Like many young people, when I was growing up I endured a lot of pain and suffering at the hands of perceived realities that didn't necessarily present 'truth', but seemed to cultivate some form of emotional incarceration. In retrospect, I can now see how certain patterns of behavior -- induced by emotional reality states -- have shaped my decisions and my outcomes, particularly in business. Life and business, of course, tend not to be all that separate, when you get down to the dirty details. I think this is especially apparent as you become an entrepreneur. It makes you look at 'failure' differently, and success more earnestly. It also makes you take a hard look at your strengths and misgivings. The catalyst? Pure, unadulterated instinct, as this new project from Steven Kotler on FLOW highlights. As an athlete, I can identify with some of the themes described by these 'supermen', although I wonder about their implications on a more group or universal type of consciousness. FLOW, as a concept itself, has been wonderfully popularized by the seminal thinker and psychologist, Mihaly Csikszentmihalyi. His perspectives on happiness and creativity have literally changed my life. As a spiritualist, I've been tinkering with the notion of personal reward as a part of a collective, post-autoletic experience. I've developed an augmentation of Csikszentmihalyi's notion of FLOW (top of this post) as an attempt to explore the intersections of emotional and temporal vitality. It's probably not very 'right', but I find it valuable in the sense that it brings me closer to understanding how empathy operates as a signifier for a group intelligence and respective skills development. I believe that empathy is the culminating point of any emotional and temporal perspective, and drives the kind of decision-making that can enable individuals to transcend, and companies to transform. We often explore the aspects of FLOW when we do innovation projects, but in startup environments it seems that we have a lot of opportunity for growth. Following up on earlier posts regarding brand economics and ecosystemic investment, it's been interesting to witness (and advise on) some shifts in the startup investment landscape. One such shift involves what can be coined as 'co-op investment'. The basic premise of a co-op is to provide a structure that aligns various resources, operators and assets such that the investment itself has shared value. So, in the case of a corporation subsidizing a co-op investment, you would have entrepreneurs, marketers, researchers, lawyers and supply chain folks inhabiting the same space, sharing resources and making sure that their collective efforts produced demonstrable results. This has been the case with P&G's Cintrifuse project in Cincinnati. What started more or less as a $60mm write-down a little over a year ago, has blossomed into an ecosystem of 23 upstart companies and a funding mechanism that pairs up strategic partners with smart money, smart resources and tons of possibility for scale (a new form of a fund-of-funds). A friend who is close to the project and I are developing ways to expand on the model, to see how this might scale in other markets around the country -- the idea being that we can develop new civic infrastructures, create new jobs and right some of our inherent social ills such as income inequality, poor education and skills development, as well as urban decay. I just returned from Grasse in the south of France, where I took part in curating an experience to reinvent the perfume industry with executive leaders and stakeholders in the supply chain. I really didn't know what to expect (a common feeling when doing 'innovation' work), and I can honestly say that I was blown away by what transpired. Human-centered design processes are obviously important in the work we do, but what's often neglected or left out is some sort of a human evolution in connecting to the intentions of what is desired as an outcome or set of outcomes. One of the themes we explored in this discovery process -- a new economic construct, really -- was conscious capital. Collective intelligence is an actual science that bridges conscious thought with conscious action. There are a number of collective intelligence camps around the world that are advancing the notions of how we cultivate and manage information, and this was the first time I had experienced 'CI' as a real science. Part of it was the methodology applied in bringing conversational data from the web into the physical space, and coordinating a relationship between the 'outside' and the 'inside' information (in essence, making the 'big data' accessible, relevant and collaborative). Another very important aspect was making participants aware of what is happening 'out there' and what is happening 'in here' -- here being their own consciousness and a relatedness to others, especially those in the room (or in the field). Storytelling is at the fore of product and system design -- it feeds off of heightened awareness through concise mental and physical play. As various groups got deeper and deeper into developing a new perfume ecosystem, their interactions -- emotions, touch, communications, understandings -- went directly into their thought processes. It was as if they didn't have to think about what they were doing... they were just doing it, creating it, manifesting it. As such, their storytelling capabilities were amplified and they were literally able to express their insights in incredibly inventive ways. And when I talk of story, I really do mean the telling of it through agents, actors and archetypes... Which was omnipresent throughout this experience. Creativity, and thus innovation, is truly collective. This might seem obvious to some, but in an executional realm it isn't, nor should it be. Truth is, we still ascribe much of our creative powers to some form of ownership ("I came up with this idea, not you..."), and innovation tends to be thought of as some 'special practice' that happens 'somewhere else'. For all the participants it became abundantly clear that they could remain in their specialty areas (executive management, R&D, production, sales, etc.) while wearing multiple hats. As one participant shared with me: "I always knew I was an interdisciplinarian!" Another participant astutely pointed out that owning the process of creation is counterproductive and counterintuitive to building a market: the more you give away the more you get back. This led to some fantastic explorations of commons practices and shared IP. There will be lots more to share on this (we're making a documentary film of the experience because it was that transformational), but it seems that we have a whole new territory to explore in how we reimagine corporate and social ecosystems... and how we can peacefully bring them together. A couple weeks back I gave a talk at the USC Annenberg Innovation Lab on how to use data and the stories behind the data to build intelligence and sustain markets. - The future of the media business as a whole hinges on three things: 1. emergence (allowing stories and ideas to flourish without media or advertising bias), 2. socialization (syndicating information streams as part of the storytelling process), 3. learning (adapting to what we discover, when we discover it). Be vigilant in your pursuit of context. Think and act critically. Always consider your fellow (wo)man. Be kind, be generous, be unreasonable in protecting your civil rights, and those of others. Make great, inspiring media. Most of all, always be informed, and if you’re not afforded the opportunity, then trust your intuition... All fundamental truth resides in your heart. And with that, the stories you tell, the information you share, can only be, and will only be, magnificent. As some of you already know, yesterday Alvin Djunaedi and I launched a new BETA version of Paperlet, the “world’s first participatory publishing platform” that allows you to develop a story with your audience -- the audience being your friends, family and other people in your social network. Well, we hope that the concept was explained to some extent above (and in the video). How this functions as a market behavior, now and in the very near future, is something we find most intriguing. Basically, this construct puts users (people) in the middle of a wonderful web of service interrelationships. As market disciplines like advertising and publishing become more and more disintermediated by a host of utilities and exchanges (real-time curation, programmatic buying, mobile-enabled and geo-targeted content creation, etc. ), creative, strategic and distribution services become more dependent on each other, and their networks, to provide value. In that sense, the “diamond” is the nexus of providing behavior that allows the creator or storyteller to leverage the best of the ecosystem to serve their needs and that of the market itself. As this hybrid service becomes an actual product, the diamond doubles down on the direct and indirect relationships that the ecosystem provides. There’s a reciprocal and sustainable effect, if you will. For example, imagine that you are a storyteller -- specifically, a journalist -- and you develop a piece on urban farming. You have a means to write the story, a way of editorializing it, even a way of turning it into a product of sorts. Why and how? The story has potential value in its uses across social or digital networks, as well as your value in the fact that you wrote it, you have experience in the field and you've provided unique insight. Inversely, the marketplace is empowered because that insight can be used to tell more stories like it, and place you in a position to make connections with more publishers who are looking to place or curate good stories. So, whether the story originates from you, a publisher or an agency is almost irrelevant... what matters is that present or realized value can be tracked and measured within the ecosystem. It's interesting to note the effect on publishing itself; I have referred to 'publishers' here as anyone or anything that publishes content, online or off (newspapers, magazines, portals, etc.). Self-publishing has emerged as a means to democratize distribution, but I would assert that without network services, this is just another tool or channel to create more content without the right readership. Further, the bar on storytelling quality is challenged as more content is created and 'pimped out' across media channels. Therein lies the core logic behind Paperlet's business model. Where platforms have historically acted as destinations (“Over here! Come check out our great content!”), the ubiquity of creation and distribution has enabled a shift in how platforms come to be. This essentially means that the macro services of purchasing, storytelling and utilities (applications) reconfigure themselves as people customize and partner with each other -- as they become participants in the development of new markets. This is why companies like Amazon are so formidable, because they are figuring out that their real power lies in how quickly they adapt their service products to the needs of the marketplace, and that of course hinges on who is operating within it. It’s a brave new world for storytellers and publishers alike… that is, if they can look at their networks and actually see the possibilities. Cultural Innovation can be defined as the process of moving ideas forward with the intention of seeing them manifest as operations, systems and/or platforms. These innovations can be borne inside, outside or alongside of organizations, they can be developed through independent alliances, or they can simply become ideas that guide us toward more powerful and productive futures (memes can have this kind of power, as one example). 'Innovation' as mindset and journey, rather than result. I hear a lot of entrepreneurs (myself included) say that they want to "change the world". Over time, I've learned to reframe the question to something like: "What is it about the world you'd like to change as a lived experience?" Or put another way, "What is it that you see in yourself that can manifest as change?" It's an elusive question at first. As entrepreneurs, many of us believe that we have the power to do anything, but we often confuse courage with understanding, and knowledge with wisdom. These elements are not mutually exclusive, but they also tend to pull at each other, and create a kind of tension that forces us to make tough choices. These choices tend to come at 'inopportune times'... such as when we launch or go to market, or when we release a new software version, or when we have to pivot our business models. We tend to think that if we make the 'right' choices at these times, then we will automagically be steered toward success. But that is only one part of the human equation. Embracing failure and 'learning forward' as properties of self-love. One of the most powerful things I've learned as an entrepreneur is that failure is actually an evolution of self. Let me repeat that: Failure is an evolution of self. I'm not talking about 'self' in terms of indulgence, interest, improvement or preservation, but in terms of awareness and mindfulness. There's a huge difference between these dimensions of self. Most corporate structures, for example, are built around the notion that in order to succeed, one must preserve him- or herself in order to advance, garner respect and to manage or lead. What typically happens is the opposite: The separation of self-intention and self-worth manifests in mixed results, or dissension amongst groups, or often negative dynamics, such as competition over status rather than value. 'Learning forward'- a term I use for the process of allowing the self to listen and engage with others - produces a different set of outcomes that are predominantly positive. One of them is that failure itself isn't really failure so much as it is the acquisition of knowledge that can become wisdom once we embrace the connection between our Greater Selves and the environments in which we live and work. Put more simply, the experience of learning shapes the perception of self through which we identify with others. It's the thing that actually enables us to innovate and to grow, as individuals and as groups. Emanating power from within (living and building by virtue of our values). Another important thing to realize is that the experience of growth, at least in the physical or material world, isn't necessarily comprised of enlightened interactions, nor is it about always having the best intentions. If anything, freewill and interdependence have taught us that the power of making mistakes is as important as the power to choose. What's interesting to note here is the tension between our Greater Selves and the material or physical world in which we live. To describe this in a crude way, the Spiritual Realm is the closest to us as our Greater Selves, yet it is the most invisible (or opaque) when we see ourselves operating in the material or physical world. This is a central challenge for all of us, as we attempt to become 'successful' in a world (currently) that often chooses not to recognize achievement as something measured by integrity or creativity, but by money or assets or ownership of domains. That said, these attributes - good, bad or indifferent - share the same spaces and provide us with the same opportunities to grow alongside of our successes. They also shape our values through learning. The answers really do lie within each of us (call it 'intuition', Watson). I often talk about data as something that helps lead us to insights about human behavior and the advancement of knowledge. I firmly believe that. I also talk about storytelling as something that expresses the human experience in extraordinary ways. I've seen it happen. What I regularly stumble upon is the notion that we must find answers in order to succeed. I'm not sure this is true. As beliefs go, it seems to be the equivalent of trading one myth for another, rather than building a story or a narrative that reflects the trust each one of us desires in our quests to become whatever it is we want to be. In other words, we, innately, are the answers. The Intuited Self - that aspect of our being which relays power through information to the rest of the world or the environments around us - is a catalyst in the transformation of the material or physical experience. It's the way we imagine ourselves producing positive outcomes, whatever those may be, and watching them manifest. What happens next is not only a constant exaflood of answers (as related to the experience created by the Greater Self), but more importantly, more questions. Naturally, the more we question, the more we learn, the more we grow, and arguably, the more 'successful' we become as manifestations of Self and Experience. The Triad of Connectivity for the spiritual audience (and spiritual demographics). In a conversation I had recently with Marcia Schafer, she enlightened me on the possibilities of creation and innovation as related to experiences in learning and listening with stakeholders. Marcia has worked with a number of organizations and leaders (some of them very high profile) over the last 15 years. To put it mildly, Marcia is incredibly wise. What I gleaned from our talk was a really profound insight: What we hear from people and what they're really saying is something we have to listen for, and that requires a love and confidence in the Greater Self from which we can be open to what's actually possible. Call it empathy, if you like. An example: You're at work, in a group setting, brainstorming over ideas. The process might feel cumbersome or laborious -- there's lots of ego, a fair amount of distrust, needs for ownership, and seemingly a lot at stake. In that moment, do you ever wonder what each and every person in that room is going through in their own lives? What compels them to speak and act the way they do? Do you then think about how you can (better) relate to them? We tend to deceive each other, and ourselves, when we don't ask these questions. CEOs are infamous for being masters of deception. It's not that they are ill-intentioned or malicious, it's just that they feel they must mask what they don't know, or what they feel that they can't impress upon their employees or the going public. They're not attuned to their Greater Selves. This, of course, affects how companies can innovate. Innovation stems from highly conscious decisions. On the subject of consciousness, it is rare (unfortunately) that we would have the chance to ask a co-worker how he or she is feeling that day, or if there are any events in his or her life that might be affecting attitude or disposition. That said, part of our personal responsibility to our Greater Selves and to others is the ability to hear what's actually being said, and then manifest it. I waited a bit to post this (not really sure why), but it's from a talk I gave late last year in Sydney, Australia at the StoryLabs event run by the multi-talented Gary Hayes. It covers off on unique methods and use cases for developing story-driven platforms that comprise various uses of data, content and media, along with considerations for revenue opportunities and scale. There's heavy emphasis on co-creation with audiences and stakeholders, and how we can enable people to participate in meaningful ways. Deck is below, audio podcast can be found here. My good pal and The Big Pivot co-author, Sasha Grujicic, and I ran a series of discussions at the Banff World Media Festival earlier this month (June 9-11) that pulled together stakeholders on the brand, media, creative and technology sides of the business. To kick off the day, we gave a brief preamble to the overarching theme: The future of advertising. The discussions went really well, so we decided to take some of the insights and blow this theme out for y’all in the websphere so that we could keep the thought generation flowing. The following is a Slideshare presentation with embedded audio; it’s more of conversation format than narration (a wee bit on the rambling side, but oh well). You’ll see that we placed a lot of emphasis on the notion of what an agency service model(s) looks like in a business landscape that is flattening and whose resources are becoming more distributed. We hope you get a lot of value out of it, and secretly, we hope you bother us about it. Cheers. P.S. Our work with nextMedia (Banff event organizer) went so well that we are developing a new format to get the stakeholders mentioned above and investors to advance these discussions and rapidly prototype new business ideas. Stay tuned. What people really think about “brands” and “ads”. There are a host of studies that address the ways in which people are affected by ads and onslaughts of marketing messages, as well as how they feel about them. Most of the data and insights are inglorious; probably the most telling are the studies based on “native advertising”. This one from MediaBrix and Harris Interactive is a pretty good indicator of why consumers have become activists in editing and avoiding ads altogether. Granted, many of these studies don’t even ask the right questions, or questions more oriented towards cultural behaviors or daily rituals. Choosing between the better or lesser of evils ("Would you rather go with option A, B or C in this rotation?") isn't exactly leading marketers in the direction of enlightenment. Brand studies are even more elusive; my favorite (I’m being facetious) is this series conducted by Interbrand, which provides geographically designated results on brands in different markets based on variables that have little to do with company operations, sustainability or customer relationship metrics, and everything to do with “brand perception” based on fixed (and arguably irrelevant) variables. The Bhutan approach to relationship metrics (specifically GNH or Gross National Happiness) is really where these survey questions should lead... But let’s not get ahead of ourselves. What this says is, as an industry, marketing and advertising is still talking to itself in a giant echo chamber, and is making huge, sweeping assumptions about customer behavior when it doesn’t have to. In short, companies, via their brands, have an opportunity to ask far better questions. And this is precisely where companies will continue to make or lose money. Marketing is intended to actually build markets. One of the smartest things I’ve heard recently came from General Electric CMO, Beth Comstock, who unapologetically proclaimed that "Marketing is now about creating and developing new markets; not just identifying opportunities but also making them happen". Comstock looks at GE as the world’s oldest startup, and this is the kind of thinking that has sustained GE as an innovator across industries for decades. If you were to look more closely at the word marketing, it would seem that this approach in building markets is a given, but of course it isn’t. Developing an ecosystem of ideas and resources (not just ads and inventory). The big talk at the CM Summit this past week (May 18th, 2013 onward) has been around building a new kind of ad ecosystem. This ecosystem specifically refers to things like a “native advertising” or “programmatic advertising” format, which basically focuses on real-time bidding in exchanges that peddle inventory or content for cents on the dollar. While I think these discussions are important in transitioning our broken ad models to better places, I think they also miss the bigger picture. For one, they presuppose that innovations in developing the company-customer relationship are predicated on technological advances (read: fancier features). For another, they almost completely ignore the power of people, their communities, and the ways they are willing to participate when the terms for consumption are more equitable. This includes our functional uses of content, data, and the contexts through which we can build customer relationships, engender trust, and monetize channels without grossly manipulating the market itself. If we can accept the Kurzweilian precept that technology is an extension of biology, then we might be able to reframe these efforts more constructively. What this really points to is a profound shift in priorities, one that takes us from models based on opacity, forced messaging and a reliance on commodified inventory, to models that place openness, adaptivity and conscientiousness at the heart of marketing and communications. Many of you are probably familiar with Coke’s escalating issues with obesity. If you’re not, you should be, as this represents a classic example of how traditional marketing and communications (to include “social media”) can’t solve real world problems -- problems that are not only complex, but those which require a whole new way of doing business. As I’ve mentioned in previous posts, the idea isn’t so much that brands and their products or services need to be perfect, but the overarching idea that they do need to be more humane. This means that operations must be far more empathic in how they treat people (customers and employees), and means that companies must do their best to empower hyperlocal economies. I will make a much stronger economic case for this in an upcoming white paper, but suffice to say that things like P/E ratios, EBIDTA, market capitalization and increasing profit margins are hardly leading indicators for a sustainable brand, or a profitable brand, for that matter. Further, it will be impossible for companies to maintain the types of margins they have now without more earnest investments in the socioeconomic environments on which they lean, directly or indirectly. What Coke can do to align its business and brand interests. The graphic should be fairly self-explanatory; it basically takes you on a journey from the moment a perceived issue erupts, and shows how a different way of extracting and cultivating a story lends to the consensual development of ideas that not only become authentic brand artifacts, but those which provide a basis for product development and job growth. You’ll notice that we go from a phase of understanding an issue, to uncovering its intentionality, to finding the purpose behind it in actions on the ground, and ultimately, developing the true meaning of its impact in the form of actionable solutions. Under normal circumstances, the usual suspects -- media agencies, PR companies, social media vendors, product innovators, sustainability firms, et al -- would work mostly in isolation. More critically, the idea of storytelling reverse engineers a very staid and cumbersome set of processes that doesn’t actually move the needle of the business or nurture stakeholder relations. In this case, notice how real world solutions can be crafted from mostly closed data loops to those that reflect a group or collective intelligence. Welcome to the future, which is right now. It is not difficult to see what is possible. We have the tools and the means. What is difficult is to shift the mindset away from a heavy reliance on automation and quantitative reasoning and towards interactions on the ground. These will allow people to become true advocates of a brand, and influencers of ideas that matter, whether they exist as messages, stories and/or pure informational utilities. In preparation for a series of roundtable discussions I’ll be leading with Sasha Grujicic at the Banff World Media Festival in June, I’ve been giving considerable thought to the near-term future of brands, and the economics associated with them. It’s certainly fair to say that brands have taken on a far more vulnerable position with consumers given the adoption of social technologies and forms of activism that put consumer groups more in control over their choices and purchases. It’s probably even more timely to concede that branding as a discipline is far less about marketing, and far more about actually building markets. Not only do leading brands own their media ecosystems, but they are building new products and services as extensions of their constituent businesses and business units. As for the notion of what a brand really is nowadays, perhaps it's best to first contextualize a significant shift in how companies operate, how they build consumer relationships, and how value is co-created and monetized more altruistically. This shift is a direct result of how money is exchanged, how debt and credit are moved around or leveraged, and reflective of the unique ways those constructs are being disintermediated by alternative currencies, crowdfunding, virtual credits and the like. Put another way, corporations have more cash on the books than banks and governments, when you consider that they have real assets along with their own credit systems. The shift they represent is one in which they can create the most change, and many of them are, as we'll see in a moment. The business models of today and tomorrow will constantly change. The agents who recognize this shift are of course poised to survive and thrive in a heavily commodified marketing industry, one still mostly reliant on bulk media buys and creative services that have a hard time justifying bottom line value within the current landscape. Saneel Radia has co-founded Finch15 to capitalize on the needs of brands who seek guidance and partnership with new, emergent business models. The folks at Invention.ist have boldly put a stake in the ground in prototyping product ideas rather than simply launching slick campaigns. Others like Kirshenbaum Bond Senecal + Partners and Rockfish have established venture arms that allow them to make key investments in emerging technologies. There are a host of other agencies, like Given, that are committed to changing the brand paradigm to one in which values are developed organically rather than through the superficial attempts found in a lot of the art and copy we see in the streets and on our screens. These new models are far from perfect, but that is not the point. The point is to embrace experimentation, and to constantly adapt these models such that innovation can become a profit center in various ways. Another point to consider is that products and services are far from perfect in their own right, and are naturally under intense scrutiny. This means that brands must evolve beyond open dialogues and actually change the function and substance of those products and services. To be more pedantic about it, if a soft drink can kill you or a clothing brand is killing its factory workers (intentionally or not), then we have a significant problem on our hands. Coke's escalating troubles with obesity are a classic example of how communications can't solve complex, real world issues. Designing systems to take on complex problems. I liken all of this to a single equivalent: We are moving away from a campaign optimization space, and straight towards one that has us building emergent systems. Think of a system as one that has a bunch of interrelated and interchangeable parts. That system may contain traditional branding elements and ad campaigns and social media content and PR stunts and all that, but more importantly, it is comprised of tools and platforms and utilities that allow people and companies to connect, learn and transact more meaningfully. Further, these dynamics call for communications to be multi-dimensional, such that push messaging is being replaced by emerging disciplines like participatory storytelling, data journalism and other forms of ‘new media’ which break through the boundaries imposed by traditional media gatekeepers. Therefore, a system is much more than the sum of its parts -- it is at once a means to educate, inform, entertain, prospect and experiment in ‘perpetual beta’. For those corporate stakeholders who are fearful, consider this: Systems are not only sustainable, but they are scalable. In other words, there’s real money at stake. Leading brands like Nike, for example, are capitalizing on social movements to better understand market behaviors and sources for new inventions, and are even accelerating business ideas that are extensible with utilities they’ve successfully built (like Fuelband). Nike still makes beautiful ads, but its real stocktaking has come in the way it builds products and services with its customers. Others, like Target, are using social platforms to crowdsource design. Others, like P&G, have created joint-venture funds to build up local economies through entrepreneurship. Even more interesting are the efforts of smaller brands like Dermalogica, that benefit from outsourcing infrastructure and by building up value in the supply chain itself. And where government or educational institutions are slow to task, new co-ops and special interest programs expedite development and allow more people and more entities to fail forward. Creating value means making investments in people. The combination of building 21st century skills inside and outside of corporations, and the ability to effectively generate policies to advance those efforts is critical, especially to a consumer marketplace that faces rising unemployment, economic volatility and unpredictable market variables compounded by technological and social acceleration. To boot, we are witnessing a similar stratification between rich and poor in first-world and third-world economies alike (Been to Detroit or Camden lately? What about Kolkata?). All of these examples, most notably, point to the development of systems that can scale by virtue of what the market does, rather than how it is dictated or manipulated. If capitalism and industrialism are to persist on any level, we must reinvent what they mean to those who produce and those who consume. They are not mutually exclusive. Additionally, all of this presents an interesting challenge for ‘brands on the fringe’ -- they can take incremental, more measurable risks to which the rewards can be magnificent, or, they can wait and watch others get into the mix, and by the time they are ready to make a move, they’ll most likely lose out on time and revenue. Brand economics are here and they are very real. It’s time for more companies, of all sizes and functions, to think about how they can create a consensual reality... transparently, authentically and emergently. It’s time to build markets of real value, like we did when advertising was directly representative of the products and services that were sold in town squares, train stations and on residential doorsteps. It's time to create real change that benefits everyone. If they are willing to become more than marks and fancy taglines, brands can resoundingly be the conduits for that change. My friend and futurist Jorgen Van Der Sloot at DIY Days in NYC, standing next to a rapid prototype. I had a terrific chat last week with Dr. Joanne Jakovich of Sydney's u.lab that was curated by the lovely Ele Jansen, a Ph.D. researcher and someone with whom I had the pleasure of collaborating when we launched WSWP (Wicked Solutions for a Wicked Problem) in Los Angeles a couple of years ago. You can read the summary on the Learn Do Share blog, but I thought Ele and Joanne steered the conversation in a really interesting direction when we started delving into more detail around group ideation and intelligence, specifically around the notions of responsibility and the enactment of ideas within an organization. I would consider Joanne's group to be at the forefront of intelligence design between large organizations. You can listen to our entire conversation here. An area of focus in my work that leverages responsibility and enactment, and streamlines some of the associative processes, is something more universally known as rapid prototyping. 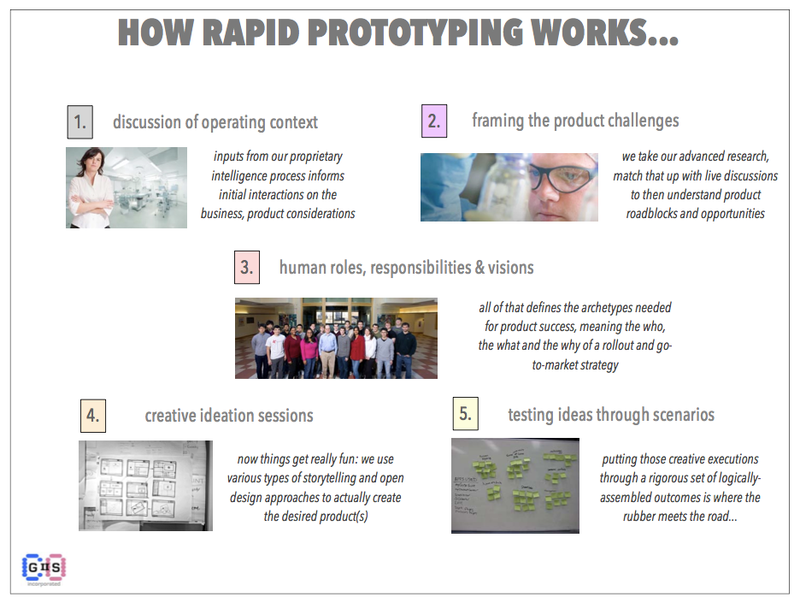 Rapid prototyping can take on many forms, and can entail the creation of anything from a big idea to a multi-platform narrative, a product or a service, a technology or a business plan... or all. People tend to think of hackathons as synonymous with rapid prototyping, but in the model I speak of here, it's intended to be a much more informed and coordinated approach to making things. This is a crude representation of how it works; this is really just a framework that adapts to the type of challenge and the domain in which you might be working. The experiences we create for organizational stakeholders can vary quite a lot, and can be quite complex in their functions, even if the outputs are not. It would be great to hear about any thoughts or experiences you've had with prototyping in general, or how you think group (collective) intelligence can better accelerate ideas.